NX Assembly Arrangements allow the user to configure and show different working positions in assembly documentation. This helps in making different views or positions of your model, letting you quickly jump back to those scenarios. Creates and edits Assembly Arrangements which define alternative component position. Note:Parts should be individually positioned in order to make the Arrangements to work, this can be done by opening the Component Properties and make the Position in the Used Arrangement section set to Individually Positioned under Parameters Tab. 1. 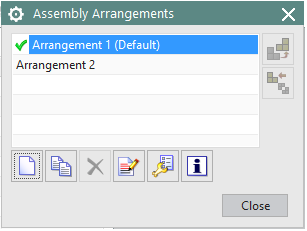 Open the Assembly Arrangements Dialog for a Model build with active Constraints. 2. Create a new Arrangement and name it as Nominal, Double click to make to active. 3. From the Assembly Navigator select all the constraints (excluding the override constraints if any) right click and set as Arrangement Specific. 4. Again open the Arrangement Dialog, create a new arrangement and name it separate, Double click on it to make it Active. 5. Now in the Assembly navigator uncheck all the Constraints and move the parts as desired. This will be the model’s separated or exploded position. 6. Open the Arrangement dialog and try to toggle between the newly created arrangements just by double clicking on the name, notice the constraints getting activated and deactivated depending on the selection in the Assembly Navigator. 7. Selecting any Arrangement and doing Update model inside DCS will pick that Model position as the DCS Separated Position. 8. So activate the Arrangement in Separate position hit Update Model and Save. 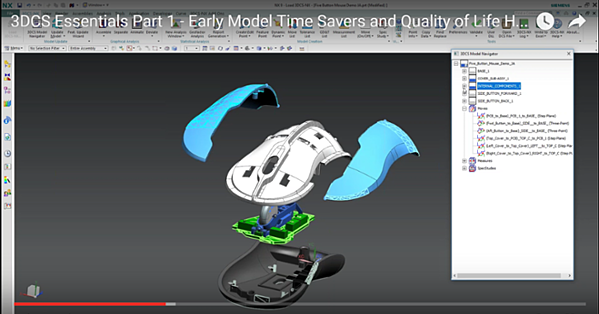 This part of the Essentials series focuses on tools and best practices that can be used in the beginning of modeling and during setup to make modeling easier throughout the process. This includes customizing tool bars, mouse shortcuts, creating scenes and Alias Display.